240 x 103 km2 of mangroves that dominate tropical continental margins from river deltas, lagoons, and estuarine settings to islands in oceanic formations (noncontinental). The landform characteristics of a coastal region together with geophysical processes control the basic patterns in forest structure and growth. These coastal geomorphic settings can be found in a variety of life zones that depend on regional climate and oceanographic processes. Hydroperiod of mangroves resulting from gradients in microtopography and tidal hydrology (Figure 1) can influence the zonation of mangroves from shoreline to more inland locations forming ecological types of mangrove wetlands. 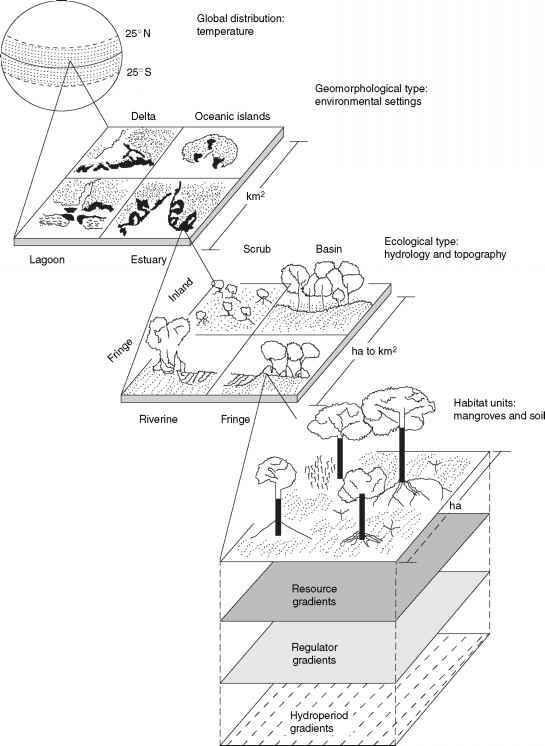 Lugo and Snedaker identified ecological types of mangroves based on topographic location and patterns of inundation at local scales (riverine, fringe, basin, and dwarf; Figure 1) that Woodroffe summarized into basically three geomorphic types (riverine, fringe, and inland). A combination of ecological types of mangroves can occur within any one of the geomorphic settings occurring at a hierarchy of spatial scales that can be used to classify mangrove wetlands. 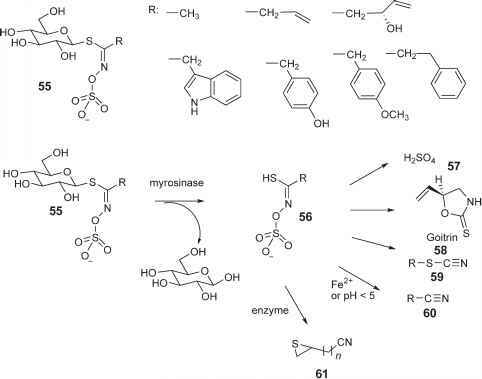 Figure 1 Hierarchical classification system to describe patterns of mangrove structure and function based on global, geomorphic (regional), and ecological (local) factors that control the concentration of nutrient resources and regulators in soil along gradients from fringe to more interior locations from shore. Modified from Twilley RR, Gottfried RR, Rivera-Monroy VH, Armijos MM, and Bodero A (1998) An approach and preliminary model of integrating ecological and economic constraints of environmental quality in the Guayas River estuary, Ecuador. Environmental Science and Policy 1: 271-288 and Twilley RR and Rivera-Monroy VH (2005) Developing performance measures of mangrove wetlands using simulation models of hydrology, nutrient biogeochemistry, and community dynamics. Journal of Coastal Research 40: 79-93. 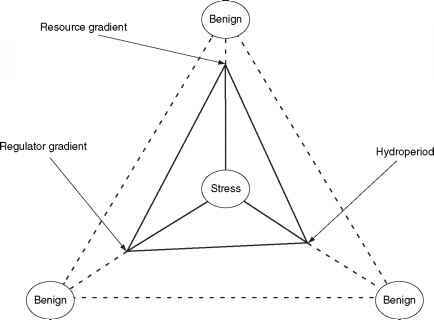 Figure 2 Interaction of three factors controlling the productivity of coastal wetlands, including regulator gradients, resource gradients, and hydroperiod. The bottom panel defines stress conditions associated with how gradients in each factor control growth of wetland vegetation. From Twilley RR and Rivera-Monroy VH (2005) Developing performance measures of mangrove wetlands using simulation models of hydrology, nutrient biogeochemistry, and community dynamics. Journal of Coastal Research 40: 79-93.
their maximum levels of biomass and net ecosystem productivity. 6 N signatures of mangrove leaf tissue can indicate stress conditions such as drought, limited nutrients, and hyper-salinity across a variety of environmental settings.